Cruise aboard the Victorian-style M/V Thomas Laighton through Portsmouth Harbor to the Isles of Shoals. Daily sightseeing tours, dinner cruises, whale watching expeditions, and fall foliage. Come aboard for a tour of the NH Seacoast's waterways. Since 1982, the charm and character of the M/V Heritage and our unique style have made us a local favorite. Publicly available boat docking. For more information, see the City of Portsmouth website, www.cityofportsmouth.com/prescottpark/docks.htm. 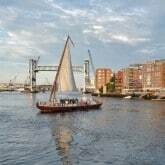 For centuries, sailing barges connected up-river Seacoast to Portsmouth. The last of these "gundalows" disappeared decades ago, but a Seacoast nonprofit offers educational programs, tours and sailing trips aboard a full-scale replica, the Piscataqua. Tugboats operated by Moran Towing Company dock at the heart of Portsmouth's waterfront and often are identified with the city.